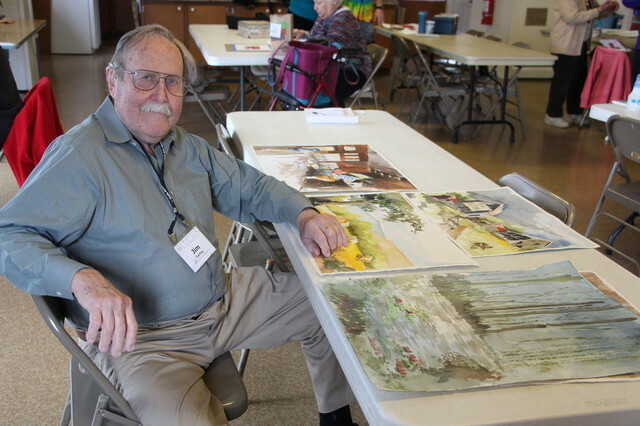 At 90, Jim Cartey continues to inspire art students enrolled in his Water Media course through OLLI at Penn State. UNIVERSITY PARK, Pa. — Jim Cartey is an architect by profession and an artist at heart. After a career spanning 50 years, including working for renowned architect A. William Hajjar, he retired in 1986 from his position as a staff architect at Penn State. For the past 17 years, he has volunteered his time to teach a Water Media class for the Osher Lifelong Learning Institute (OLLI) at Penn State, never missing a semester. Cartey, of Centre Hall, turned 90 years old in February. His students shared their awe of his accomplishments. “He’s so talented, so willing to take his talent and let it shine on other people,” Gail Carty, OLLI at Penn State student, said. While Cartey talked humbly about his talent in class, Marie Doll — executive director of the Art Alliance of Central Pennsylvania — said he is a longtime member of the Art Alliance and his watercolors have appeared in many of their exhibitions over the years. OLLI at Penn State is a membership organization offering affordable courses, trips and social activities geared toward adults who are 50 years and older, but anyone over the age of 18 can participate. Course instructors are volunteers; many are Penn State professors, but others — like Cartey — are hobbyists or professionals who work with OLLI to create a class where they can share their talents with others. OLLI at Penn State offers classes geared toward a variety of interests, including art and dance, astronomy, entomology, politics, fitness, travel, financial planning, food, philosophy, technology and more. To inquire about becoming an OLLI at Penn State volunteer instructor, member or to register for a class, call 814-867-4278 or visit OLLI at Penn State online. Centre County families with young drivers can take part in a free teen driver safety event being held by the Pennsylvania Department of Transportation and Pennsylvania State Police. The "Arrive Safe" program will take place from 6 to 8 p.m. on Wednesday at Bellefonte Area High School and is open to all Centre County families.